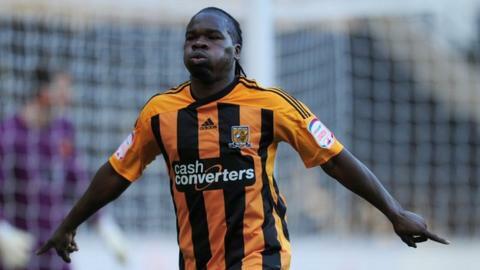 Sheffield Wednesday's slump continued as substitute Aaron Mclean's winner helped Hull end their poor recent run. The Owls have failed to win any of their last eight matches and did not earn a single point in September. Wednesday started brightly and missed several clear chances before Hull started to get on top. It was Mclean, on for Jay Simpson, who scored within two minutes of coming on when he slotted a low shot past Chris Kirkland after neat approach play. Wednesday boss Dave Jones, who guided the club to promotion last season, may be wondering where the next point will come from after seeing his side slip into the bottom three. The home side should have taken the lead when some good work from Michail Antonio and Ross Barkley set up Chris O'Grady but the striker could only put his effort over the bar. Antonio continued to be a threat and he cut in from the left and curled a shot which brushed the outside of the post. The Owls almost went ahead but Miguel Llera's header was cleared off the line before Hull hit back with Paul McKenna and Stephen Quinn firing wide before Sone Aluko wasted a glorious chance. It was Hull boss Steve Bruce's tactical switch which sparked the winner when Mclean broke one-on-one with Kirkland and found the back of the net. Wednesday searched in vain for an equaliser as Hull made it five wins from 10 league matches. "It's not a game we felt we deserved to lose but you can't keep saying that. I think everybody is just frustrated. "We created our own problem by switching off for the goal. We've got to stop conceding sloppy, lazy goals and that's what it all comes down. "It's a bit frustrating for us but we've got to take hope from the performances and not the results sometimes." "We had six missing today who were injured and we were only able to name six substitutes, but we still managed to come here and get a result. "I've got the experience to handle it but you always need to stop losing runs."